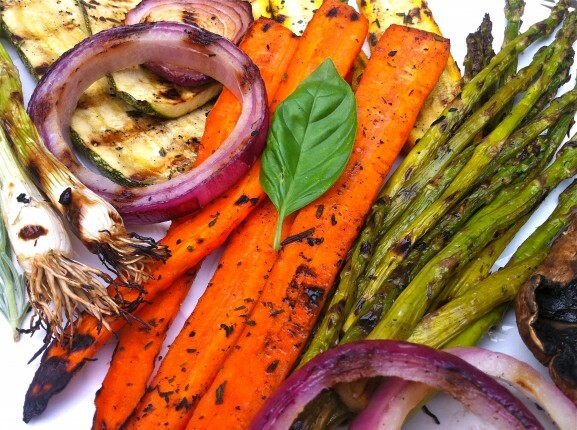 In my book, grilled veggies are fabulous for so many reasons. First and foremost, they taste great. But also, they are easy to prepare and need nothing more than a bit of olive oil, salt and pepper. However, they can be fancied up with any number of marinades and herbs. Vegetables can be grilled in advance and served at room temperature. Moreover, so many vegetables lend themselves to grilling, leaving something to please everyone. Perhaps my favorite thing about grilled veggies is the leftover possibilities. I adore a good grilled veggiewich (for my favorite preparation click here), and one of the easiest dinners is a poached or over-easy egg served atop of a bed of grilled vegetables. The yolk creates a sauce of sorts for an easy, rustic, healthy and tasty meal. Likewise, leftovers can be tossed with mixed greens and drizzled with a good balsamic vinegar for a hearty salad or chopped and tossed with cooked quinoa, wild rice or couscous and served warm or cold. The possibilities are endless…and so delicious! In the winter months, consider these same round-two options with roasted vegetables. And as an alternative to this simple marinade, try my easy 1/3-1/3-1/3 marinade for an Asian twist, or simply brush with olive oil and sprinkle with kosher or sea salt and freshly ground pepper. If you plan to roast a large amount of vegetables, increase the amount of marinade by fifty percent or even double it. vegetables for roasting: zucchini, eggplant, portobellos, asparagus, plum tomatoes, scallions, carrots, peppers, onion, etc. Mix the first three ingredients in a zipper top bag or bowl. Add vegetables and toss to coat. Allow to marinade for a half an hour or so. Longer is fine. Remove to a baking sheet and sprinkle veggies with salt, pepper, rosemary, and thyme. Grill over medium-high heat until the vegetables have nice grill marks and are crisp-tender. Will try this. Looks like an easy dish to prepare. Can you roast these in the oven? I think roasting would be a great option!